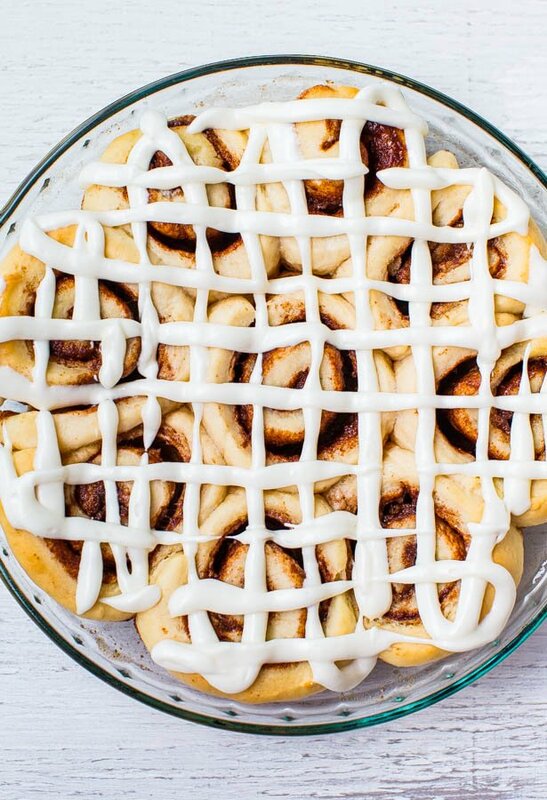 I love cinnamon rolls and was craving them but didn’t feel like the work of making them. Even thought I have 15 recipes for them, including a one-hour recipe, I still wanted to keep the work to an all-time low. Enter this easy, one bowl, no-mixer cake with lovely cinnamon flavor that’s ready in no time. I have another recipe for a cinnamon roll cake but this one is even easier. That’s what happens after 8+ years of blogging. Things I made 5+ years ago don’t always register in my memory until after I start on a new recipe only to Google ‘cinnamon roll cake Averie Cooks’ and remember I’ve already made one. But I digress. The recipe is adapted from these cakes. I love this cake base because cakes always turn out supremely moist, springy, and fluffy thanks to buttermilk, sour cream, and oil. It’s impossible to have a dry cake with that trio of moisturizing and tenderizing ingredients. 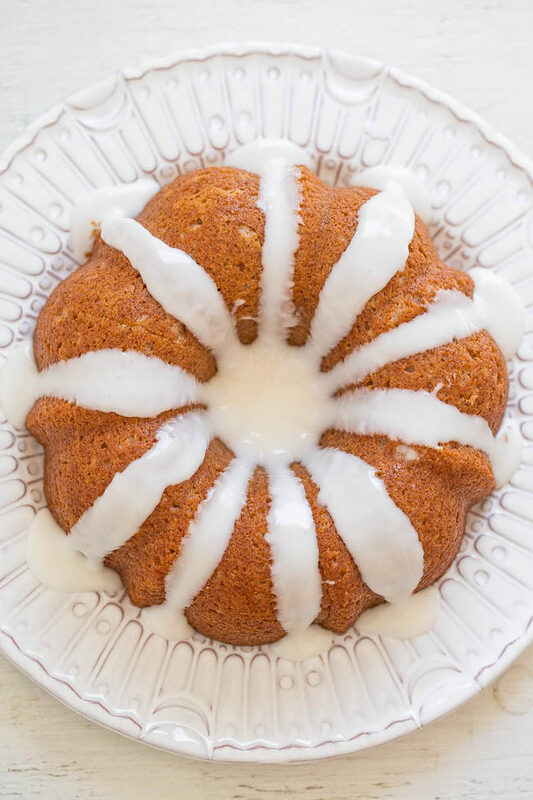 I used this 6-cup Bundt pan, sometimes called a half-Bundt pan. The recipe would likely work in an 8-inch square pan, baked for approximately the same duration. You could likely double the recipe and bake in a standard 12-cup Bundt, and you’ll need to increase the baking time. I haven’t tried these tweaks personally. Cinnamon rolls aren’t complete without glaze and because I made the glaze with buttermilk it’s perfectly sweet with a tiny amount of tang. 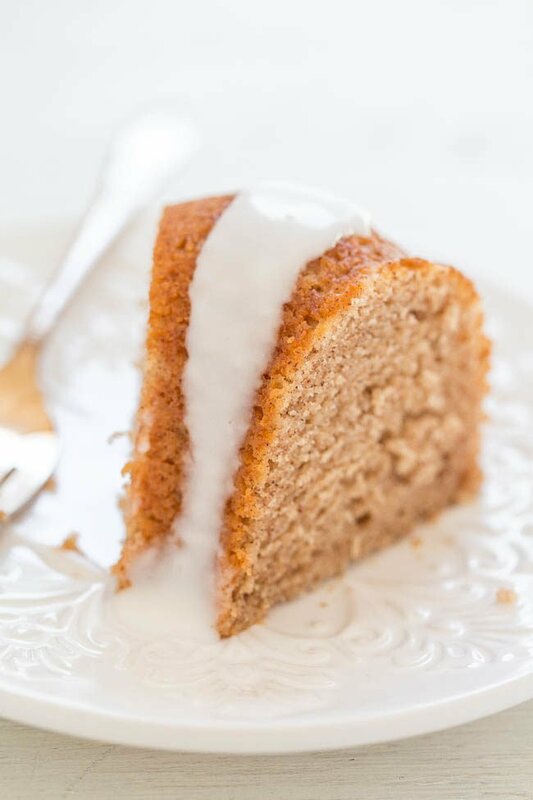 It gives the illusion of a cream cheese glaze, minus the cream cheese, and makes use of the buttermilk already needed for the cake. You may not need all the glaze but unless my bite is flooded, there’s not enough. This is an easy, one bowl, no-mixer cake that with lovely cinnamon flavor that’s ready in no time. The cake is supremely moist, springy, and fluffy thanks to buttermilk, sour cream, and oil. I used a 6-cup Bundt pan, sometimes called a half-Bundt pan. The recipe would likely work in an 8-inch square pan, baked for approximately the same duration or doubled and baked in a standard 12-cup Bundt. The glaze is perfectly sweet with a tiny amount of tang and gives the illusion of a cream cheese glaze. You may not need all the glaze. Cake – To a large bowl, add the flour, sugar, cinnamon, baking powder, salt, and whisk to combine; set aside. In a 2-cup measuring cup or medium bowl, add the egg, buttermilk, sour cream, oil, vanilla, and whisk to combine. Bake for about 35 to 40 minutes, or until center is set, top is lightly golden, and a toothpick inserted in the center comes out clean or with a few moist crumbs, but no batter. Place pan on a wire rack and allow cake to cool for at least 1 hour (overnight is okay) before inverting. Inverting too early can result in a cake that sticks to the pan, falls apart, or doesn’t release neatly; do not to rush the cooling duration. Shortly before inverting, make the glaze. 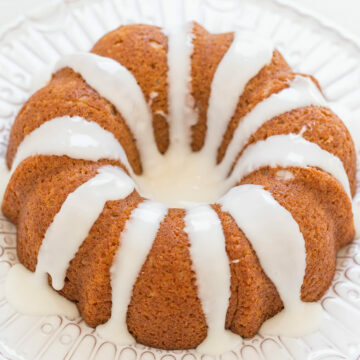 Glaze – To a medium bowl, add the confectioners’ sugar, optional cinnamon (I left my glaze plain), 2 tablespoons buttermilk, and whisk until smooth. As necessary add additional buttermilk to reach desired glaze consistency. Glaze should be pourable but not too thin or it will slide off. You may have extra glaze depending on how much you like on your cake; set aside. Carefully invert cake onto a cake stand or serving platter. Evenly spoon the glaze over cake and serve. Cake will keep airtight at room temperature for up to 5 days. I’m comfortable storing glazed items with dairy at room temp but if you’re not, store cake in the fridge noting it will be more prone to drying out. Extra glaze will keep airtight in the fridge for many weeks. Glaze will soak in as time passes. 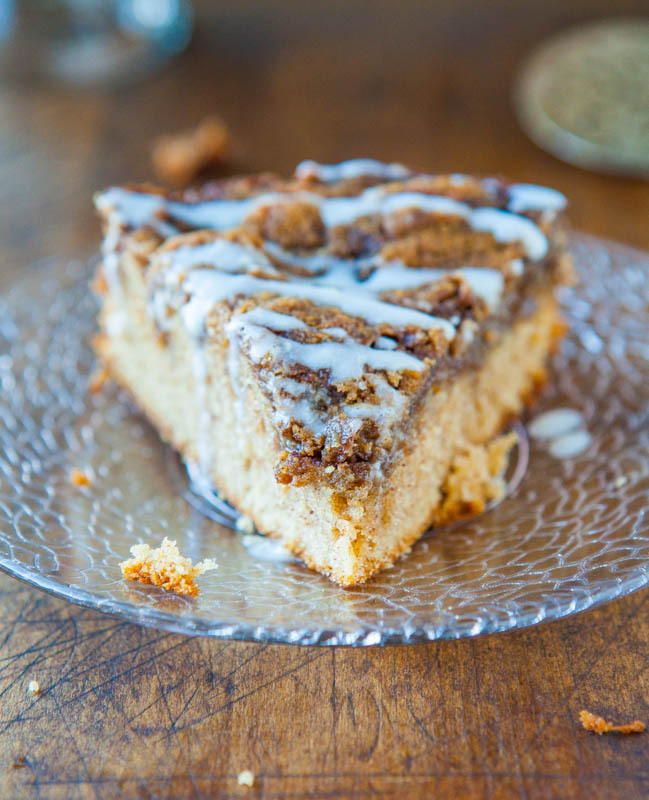 Cinnamon Roll Coffee Cake with Cream Cheese Glaze – The great taste of cinnamon rolls minus any of the waiting or work! Easy and everyone loves this cake! 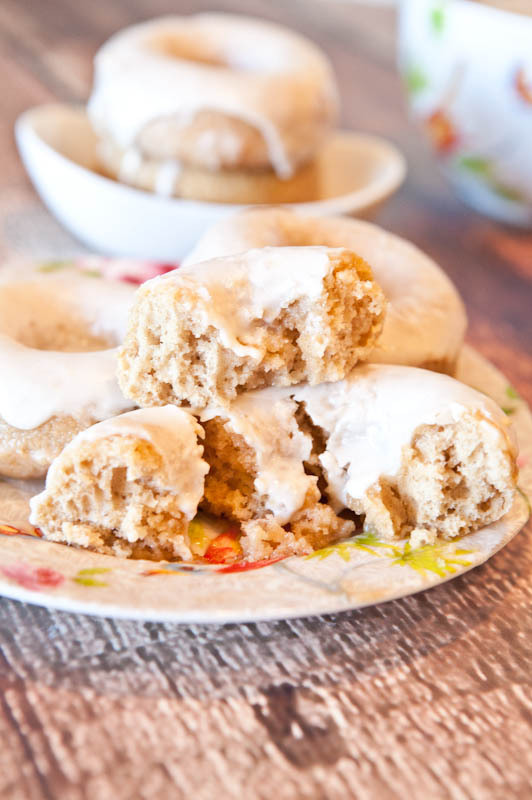 Baked Cinnamon Bun Donuts with Vanilla Cream Cheese Glaze – A cross between a Krispy Kreme donut and a Cinnabon cinnamon roll! Easy and so good! 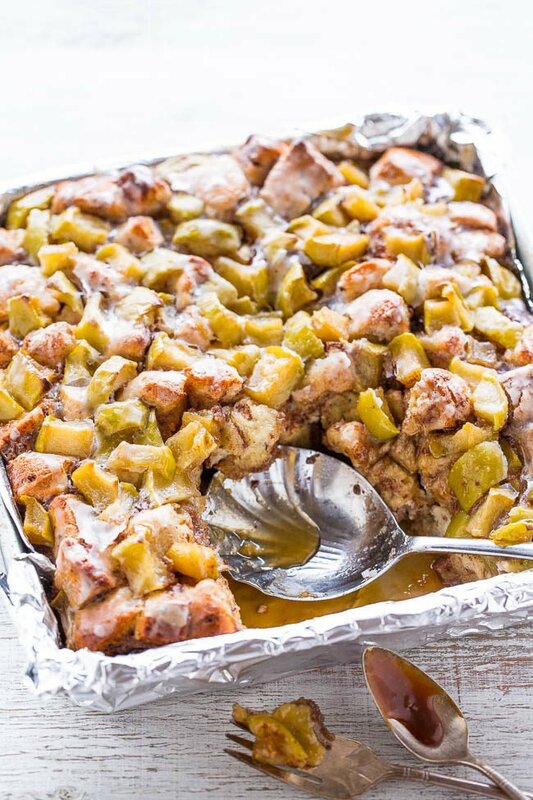 Caramel Apple Cinnamon Roll Bake – The soft and gooey factor of a Cinnabon with apples and so much caramel sauce! Easy, ready in 30 minutes, and one of the best desserts ever! 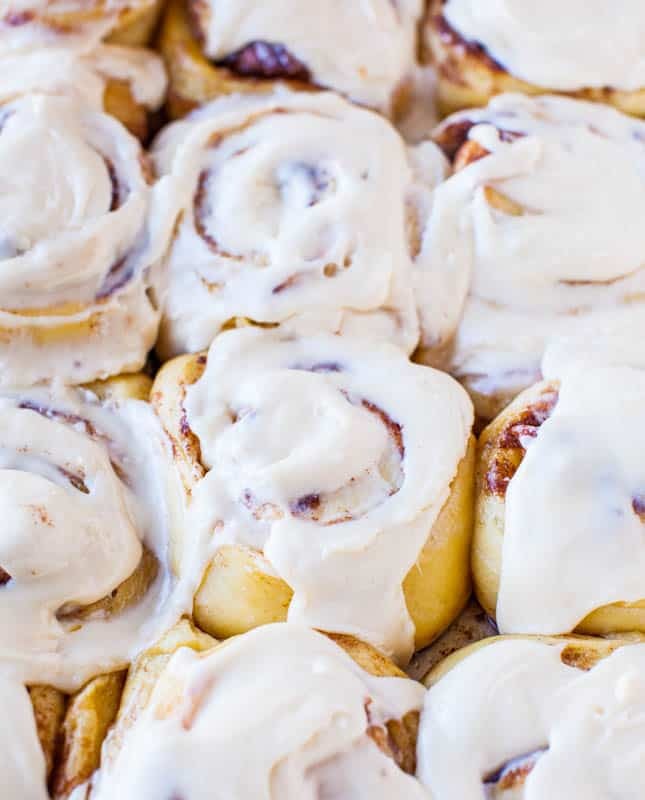 Overnight Buttermilk Soft and Fluffy Cinnamon Rolls – For soft, fluffy, pillowy, perfect cinnamon rolls when you need a larger batch, it’s my go-to! A reader and personal favorite! 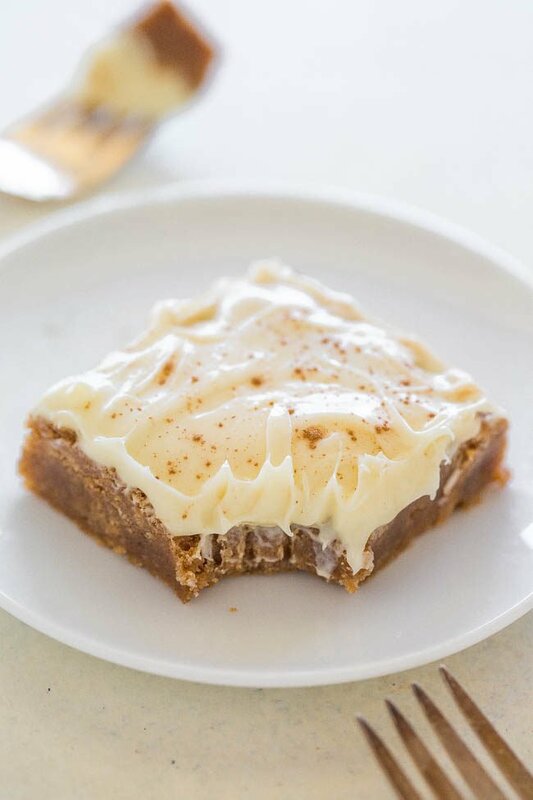 Cinnamon Roll Bars with Cream Cheese Frosting – ll the flavor of cinnamon rolls, minus the work! Easy, super soft, chewy, and the frosting truly is the icing on the cake! 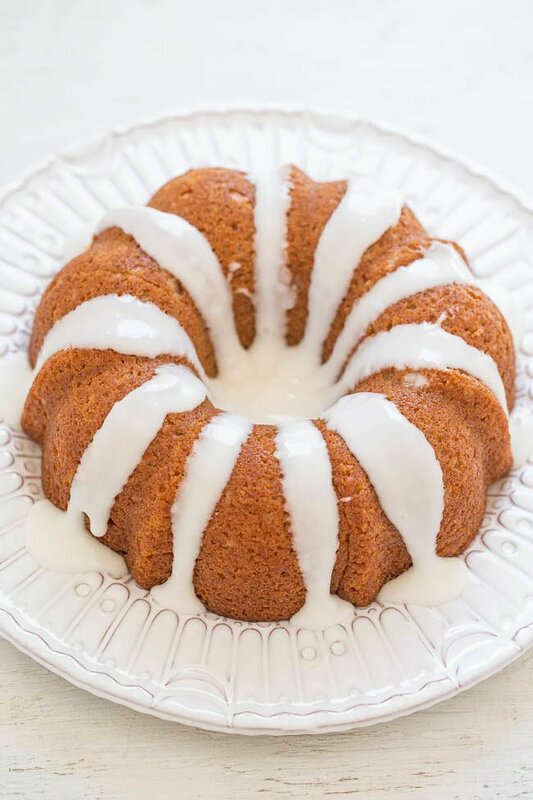 Bundt cakes look elegant even if they are simple to make and I love how the extra glaze pools in the middle. This sounds delicious! This looks insanely good. I’d eat it ALL! OMG! I love that you googled it and came back with your own recipe! HAHAHAHA! You are the best. 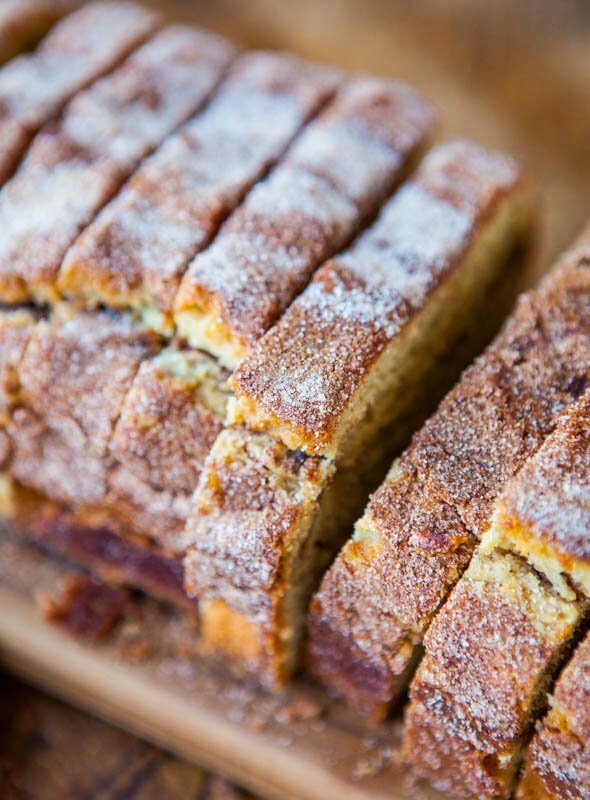 That blueberry coffee cake is an oldie but a keeper! But if you wanna switch it up, this one is good! I may have inlaws coming in next week. I was thinking about a lemon dessert, but this in an 8″ pan just might be perfect! I went ahead and made this today in an 8″ pan. It only took about 20 minutes to cook, so I’m glad I checked it when I did. Also, I cut my sugar back to only 1/4 cup and used 1/4 cup of Truvia baking blend. I haven’t tasted it yet, it’s too pretty, but it sure looks….scratch that, I just took a bite and it’s delicious!! Will definitely make again! Glad it worked out great for you and yes anything in a flat pan will bake faster than in a Bundt pan. And reducing the sugar will generally reduce baking time too (Because sugar liquifies in the heat and the less sugar, the less liquid that’s created, the less baking time) – just some trivia for you. Glad you’ll definitely make it again! Good to know! I was curious about one other thing. The cake was very flat, like a a brownie type of flat, instead of puffy. Would that also be due to the Truvia instead of sugar? Yes absolutely. Nothing will give you the same results as real sugar. Hello, you think whole wheat flour may me used in this recipe? I wouldn’t because it will be more dense and possibly dry. I would make it as written. I love your recipes. This looks so amazing. I’d like to make it tomorrow so, it is ready for Easter brunch. If I doubled it and made it in a regular Bundt pan, how much extra time would you recommend I add for baking? It’s hard to say because I haven’t tried it that way. Just keep a close on eye on it and bake til it’s done. Good luck and Happy Easter! Thsnk you Averie. Happy Easter! I made this for Easter brunch at church and we liked it! Love the cinnamon in the glaze–nice touch! I recently made this cinnamon roll cake (doubled it) and it didn’t last long enough to glaze! Soft, moist, and a perfect snack cake! Thanks for trying the recipe and I’m glad it came out great for you! Glad it was perfect and that a double batch went quickly!